WHY WOULD THIS JOURNAL MAKE A GOOD GIFT? Every family has favourite recipes. The ones that come out every Christmas or special occasion, the ones that you remember fondly from your own childhood or the ones that make up your favourite weekday meals. They all have memories and thoughts associated with them, they are part of your family history and your stories. And wouldn’t it be great if they were able to be passed on to other family members. it has a classic style – and has none of the “tweeness” or “tackiness” of many published family recipe folders. it has limited space for recipes per section (18 pages per section for appetisers, mains, desserts etc.). While some might see this as a negative, we think it’s good in that it makes you edit and prioritise your favourites – so the task of recording won’t go on forever. The Moleskine Recipe Journal presented in this way makes a great gift idea for a bridal shower, engagement, wedding, house-warming, Christmas or birthday. If you’ve been watching the Australian Masterchef show over the last couple of years, you might remember seeing George pull out his “cook’s bible” or collection of recipes from his apprenticeship. Everyone who cooks, whether just for themselves or for a family, as a hobby or as a lead-up to a serious attempt at masterchef, could do with a special place to record all those standard recipes, special recipes, tips & tricks they learn along the way. 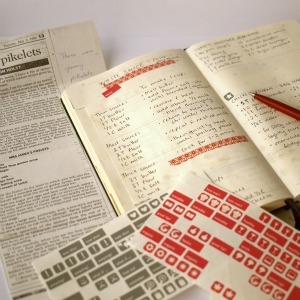 it is customisable – as well as space for recipes, it also has half the journal blank to fill in as you like. So you are able to customise sections however suits you best (sauces, techniques, flavour profiles, expert tips etc) It also includes over 200 stickers and icons which can be used to further personalise the journal. Give recipes a “thumbs up” or categorise dishes into summer/winter favourites etc. The Moleskine Recipe Journal presented in this way makes a great birthday, Christmas or anytime gift for those interested in food or cooking. 1. It will last. As noted above the Moleskine notebooks are durable and the covers will stand up to being stuffed in and out of drawers, left on the kitchen bench or carried around in a backpack or handbag. They are also book bound, rather than glued, so pages will stay intact and they can be stored upright on a bookshelf for easy reference. 2. They are classically styled and they feel good to use. Designed in Italy, with the heritage of European craftsmanship and journal making behind them, these are the kinds of notebooks that have been used by writers and artists for over two centuries. Although now made in China, the Moleskine journals are still handmade and each one is individually numbered and carefully checked for quality. You can feel the quality of the journal when you hold it, plus it’s stylish and the lovely ivory-coloured paper feels very soft and smooth to write on. ARE THERE ANY DOWNSIDES TO THIS PRODUCT? After personally using one of these journals for over a year I have only found one problem – if you use it too close to the stove top you can get a lot of food splatters on the pages. Because the paper used in Moleskine journals is fine, and not waxy or thick, it means that food or oil spilt on the journal stains quite quickly. Depending on your point of view this can either add to the journal’s character, or lead an unwanted messiness to the pages. Our advice is to not stir-fry too close!! I had to present this posting, “Moleskine Passions Recipe Journal Review � The Paper Package Blog” along with my personal good friends on fb. Ijust wished to distributed ur excellent publishing!